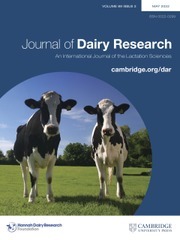 The Journal of Dairy Research is an international Journal of high-standing that publishes original scientific research on all aspects of the biology, wellbeing and technology of lactating animals and the foods they produce. The Journal’s ability to cover the entire dairy foods chain is a major strength. Cross-disciplinary research is particularly welcomed, as is comparative lactation research in different dairy and non-dairy species and research dealing with consumer health aspects of dairy products. Journal of Dairy Research: an international Journal of the lactation sciences. How does changing the feeding bin affect cows’ behaviour?